"Farm to Table: Migrant and Seasonal Farmworkers"
Monday, 9 a.m. to 9:30 p.m.; Tuesday through Thursday, 9 a.m. to 6:30 p.m.; Friday, 12 p.m. to 5 p.m.; Saturday, 10 a.m. to 5:30 p.m. The approaching season of feasts kicked off the tastes of fall, with cheerful trips to famers' markets for fresh apples and cider, pumpkins and squashes. But as we indulge in the fruits of the harvest, it's important to think about whose labor brought those fruits to our tables. As the presidential election approaches, our national discussions are filled with rhetoric about migrant and seasonal workers and their place in America. This highly complex subject should to be treated with the utmost nuance, but a good starting place for many of us is putting faces and the deserved dignity to the people who carefully harvest our food. This Saturday, students of Arleen Thaler's most recent Social Reportage class do just that in a photo show opening at the Genesee Center. 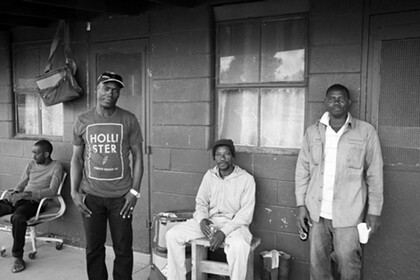 "Farm to Table: Migrant and Seasonal Farmworkers" includes about 40 images by seven photographers, ranging from teen to retired, who participated in Thaler's third Social Reportage course. Images in the show reveal the proud faces of the harvesters, their work-worn hands, the kinds of produce they handle, the tools and machines involved in the harvest, livestock, and the orchard, farm, or farm stand environments. Other photographers focused on bits of historic importance. 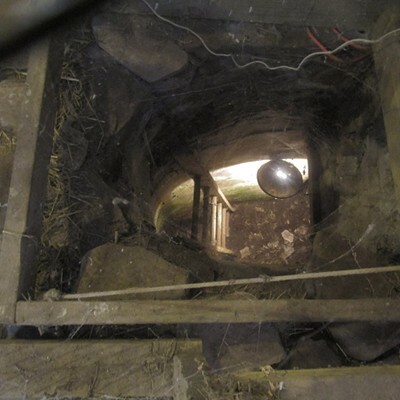 One shot, by Marge Forth, peers down into an underground space at Murphy Orchards in Burt, New York, where between 1850 and 1861, escaped slaves were sheltered in the hidden room in the cellar of the barn. One past Social Reportage classes had students focus on refugee populations living in Rochester. Thaler says her interest isn't in teaching photography or documentation per se, but in encouraging respectful immersion in order to learn truths. She had to learn this herself when in 2009 her relationship with a homeless person with alcoholism sparked her interest in learning about how homeless people survive in Rochester. 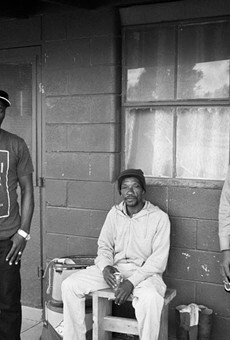 Through visits to soup kitchens and staying at shelters, Thaler built relationships with members of the chronically homeless population in our city, using her background as a photographer to document the nuances involved. Over the course of 13 weeks, Thaler encouraged students to make connections in order to acquire access to farms, and showed them how to approach and get to know the workers. "It becomes a partnership of photographer and subject, working to create these images that are really natural," she says. Though she doesn't teach photojournalism, Thaler impressed on her students the importance of photojournalist ethics, such as avoiding the misrepresentation of subjects, and not manipulating images. Some students focused on hands, portraits, or people at work, whether that meant picking apples or working a farm stand counter. But the overall theme is on the ritual of the Harvest, with an interesting subtext that many who enjoy it are detached from bringing it about. "It's such a delicate thing, the harvesting of apples," Thaler says. "I failed miserably when I tried it." The days were hot, and the workers were wearing heavy sweatshirts and work boots, Thaler recalls. The collection bags they wore reached about 45 pounds when full. 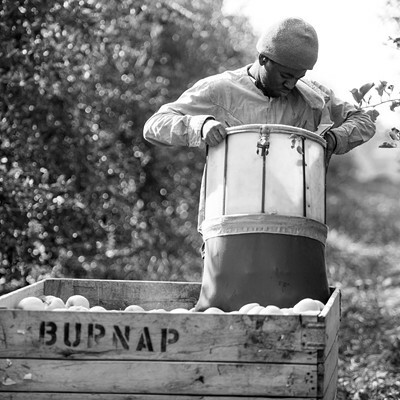 "And then the process of dumping the apples has to be really tender and delicate," she says. "They take pride in their work. It's a skilled labor -- a lot of us would be fired within the first week." There are 36,000 farms in New York State, some of which have severe problems with abuse of their workers. 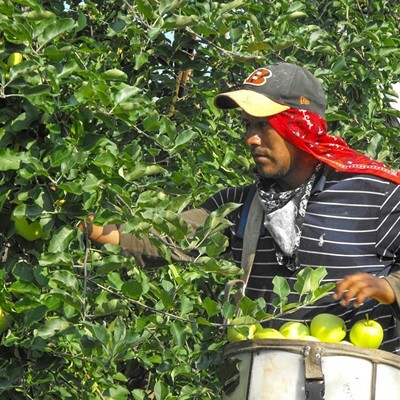 The migrant and seasonal worker topic as a whole is an extremely complex one. But Thaler is motivated to show the dignity of the workers in a way that expresses gratitude, and show that many of the farmers "do treat their workers with love and kindness and respect." After learning of abuses, "we're kind of all expecting to go in and see atrocities," she says. 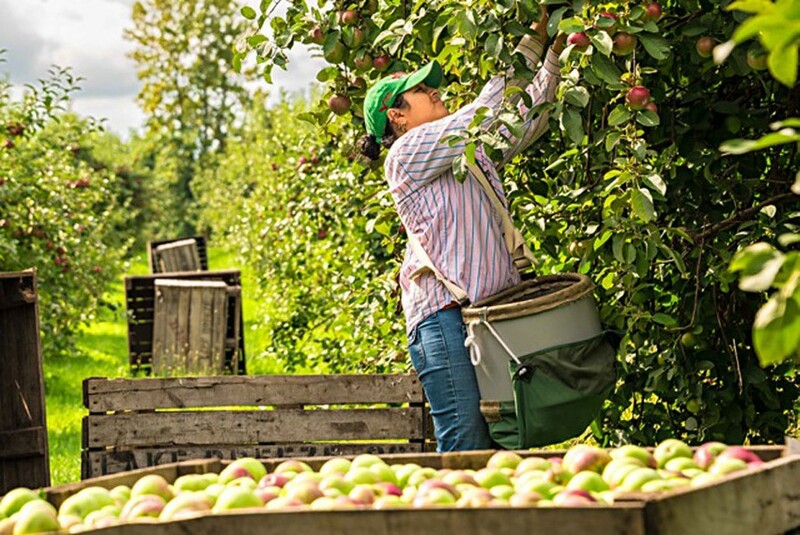 But some of the farmers who gave access to the class form family-like relationships with the seasonal workers, and some go on vacations to visit the workers in their home countries so their whole families can remain close and learn about one another. Despite the popularity of Social Reportage, this will be the last course Thaler will teach for the foreseeable future, as she is shifting her focus to her work with the Flower City AmeriCorps anti-poverty initiative. "Farm to Table" opens on Saturday, November 7, with a reception held from 2 to 5 p.m.